This light model is small enough to find room even in a backpack. It is equipped by a coaxal wire with laser markings on a reel. 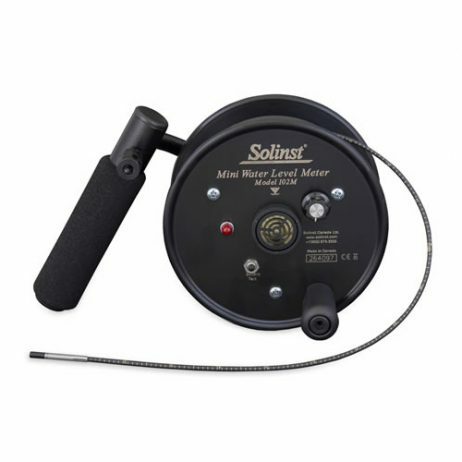 Water Level Meter Solinst Model 102M – this light model is small enough to find room even in a backpack. It is equipped by a coaxal wire with laser markings on a reel. The accuracy is provided by showing each 1/100 ft. or each millimeter. The length of this model is 25 m.
Model 101 is equipped with a plane tape which is wound round a reel. Corrosion resistant small-sized probes of two kinds are situated on a narrow wire. 9 volt battery serves as a energy source. The contact of each probe with water surface makes the electric circuit close up. This activates the sound and a light. After that markings on the tape show the measurement of water level. Possible movement of water while measuring will not disturb the accuracy because the signaling system can be turned off when needed. This gives a distinct signal in every conductibility circs. Ergonomic design of the reels which include comfortable handgrip and a solid holder for probes makes them easy and pleasant in usage. The battery within easy reach is very quick to replace. 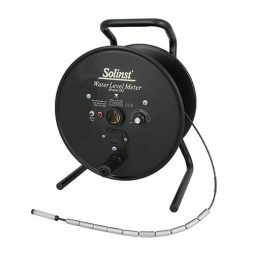 The sensibility switch as well as the light and sound systems, battery test button, drag and a tape guide complete the equipment of the reels. The reel itself is of small size but it stands solidly on the ground. The probes are perfect for working with very hard-to-reach places such as the channels of the Solinst CMT System, DrivePoint Piezometers. The markings on the wire covered by polyethylene are dislodged with heat and allow precise accuracy in measurements from 30 up to 300 meters. Flexibility qualities are provided by copper covering and the wires themselves are made of stainless steel. It makes them non-expandable and solid. Fixing and splicing such wires becomes practically effortless. 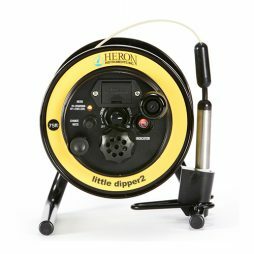 The little dipper2 is a compact water level meter designed for ease of portability, used to measure both static and falling head levels in wells and boreholes. 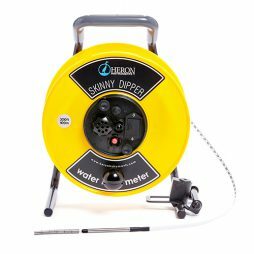 This portable model will provide accuracy while measuring water deepness, particularly in hard-to-get places, for example in narrow tubes. This is a perfect tool to measure static water level in hard-to-reach narrow places.